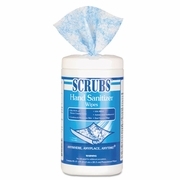 Home > Janitorial, Household Cleaning Supplies, Foodservice Products > Hand Sanitizers (Liquids, Gels and Wipes) > Scrubs® Antimicrobial Hand Sanitizer Wipes 6/cs. Highly effective antimicrobial low-alcohol formula dissolves contaminated biofilm; kills, absorbs, and removes 99.9% of disease-causing germs and bacteria from the skin, including E.coli, pseudomonas, salmonella, staph, and strep. 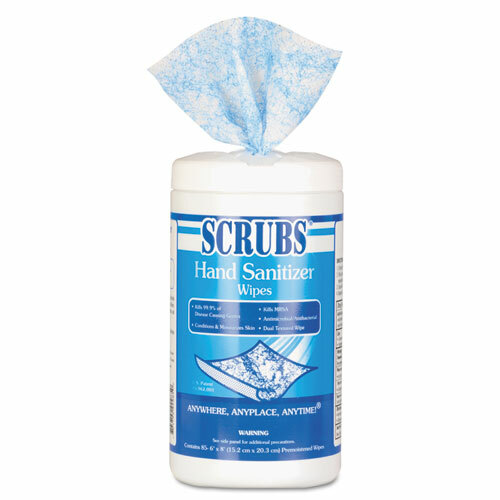 Controls infection, prevents cross-contamination. Conditions and moisturizes skin. USDA Classification E4. 85 perforated 6 x 8 wipes per canister. 6/cs, sold by the case.